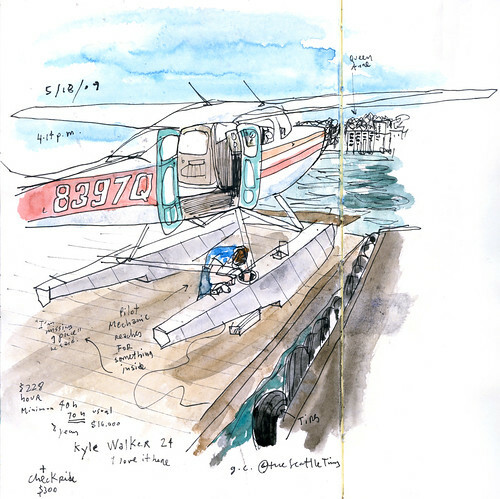 I made a stop by Seattle Seaplanes on South Lane Union, where the docked floatplanes are screaming to be drawn. I’ve had my eye on them for a while and blog reader Bob Messina of Seattle recently sent me an email suggesting this location. While I was sketching the blue vintage plane parked at the entrance of the business (top left corner,) a pilot/mechanic who works here showed interest in my drawing. Later, I stopped by the dock where he was fixing a plane. His name is Kyle Walker and he just moved to Seattle from Michigan two years ago. He’s 24 and has been fixing and flying planes for about eight years. He loves what he does. “It’s awesome,” he said.